Brighton’s ‘birdcage’ bandstand (1), one of the finest surviving Victorian bandstands, was constructed in 1884 as part of a wider scheme of improvement for the town’s western seafront. 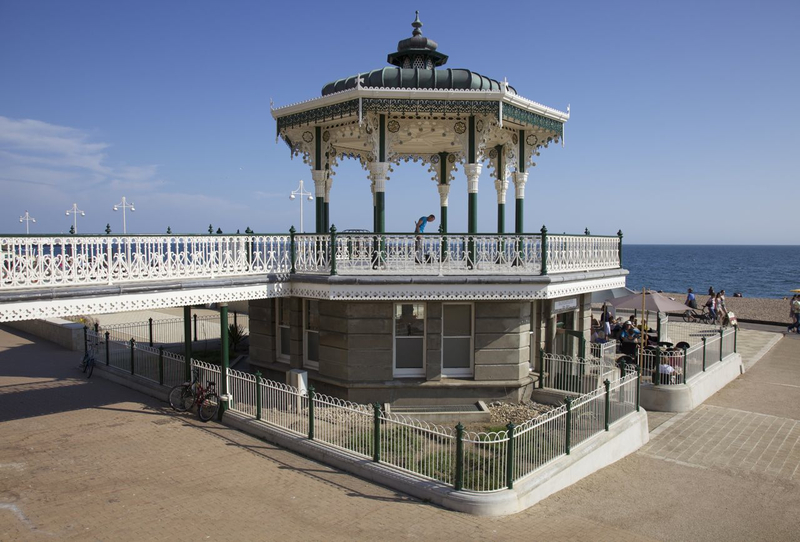 The original structure (2) included toilets and changing rooms on the ground floor, accessible from the seafront, and a bandstand or shelter above linked to the King’s Road by a bridge. The entire structure was designed by Brighton Council’s surveyor, Philip Lockwood, who was also responsible for many other iron structures on the town’s seafront, including several shelters and the Madeira terrace and lift on the eastern esplanade. 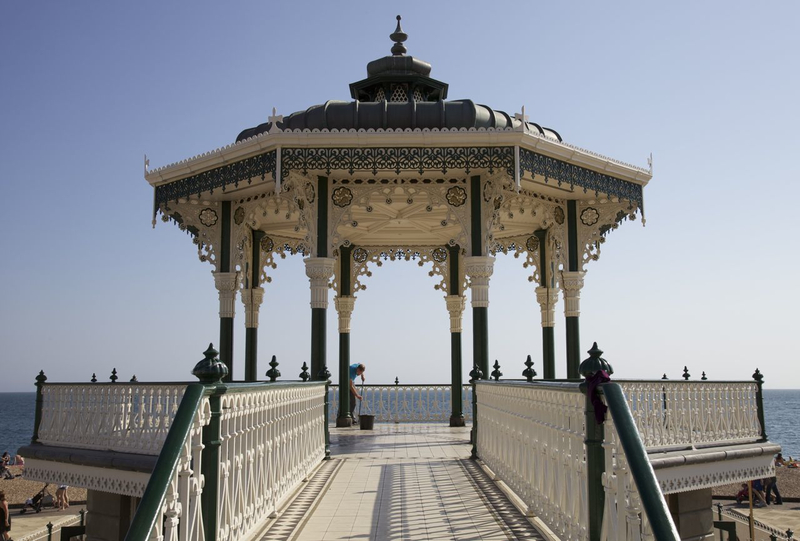 All of these structures, including the bandstand, were manufactured by the Phoenix Foundry in nearby Lewes, and their name can be seen on almost all of Brighton’s ironwork, from the Palace Pier to the railings and lamps that line the seafront. 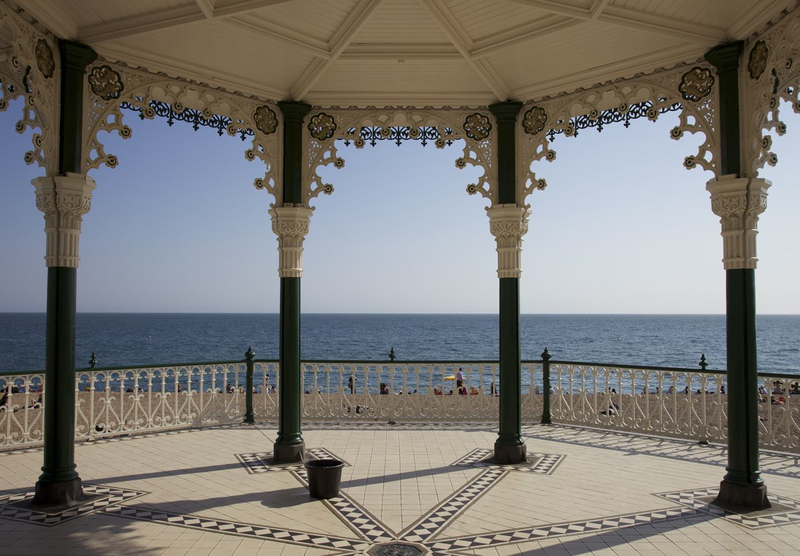 The extravagant design of the bandstand has been compared to ‘oriental’ buildings such as the Alcazar in Seville or the Alhambra in Granada. Like much seaside architecture of the late-Victorian period, its ‘cake-icing’ decoration (3) reflected its seaside context, where visitors escaped the drudgery of everyday life into a more exotic, exciting and enchanted world. The overtly ‘oriental’ style of the decoration of this bandstand evoked distant lands where pleasure reigned, albeit now presented to the many rather than the few. This direct association with pleasure has given this kind of ironwork a frivolous identity, dismissed by architectural historians as a subject unworthy of serious study. Yet, Victorian seaside resorts were operating in a cut-throat world of competition for a rapidly exanding but class-divided populations of holidaymakers. Resorts like Brighton developed distinct identities that were fiercely protected by local governments and residents alike. The design of seemingly trivial structures like bandstands came under the sway of powerful notions of place-making, class identity, and visual decorum. Thus, the inclusion of dolphins in the spandrels of the bandstand (4) is no mere decorative whimsy; on the contrary, dolphins were part of Brighton’s civic arms and a long-standing emblem of the town. In this and many other iron structures in Brighton, dolphins reinforce the visual identity of the town that distinguished the town from its many competitors on the south coast. In addition, in relation to the bandstand, nearby wealthy residents in Bedford Square initially voiced objections to the new structure, which they felt would spoil the view of the sea and possibly encourage the congregation of disreputable crowds of lower-class holidaymakers. No doubt the inclusion of toilets in the structure fuelled these anxieties. Lockwood’s design reflects the delicate sensibilities of these socially-superior onlookers – the toilets are invisible from Bedford Square and only accessible from the seafront esplanade below, while the elaborate decoration of the bandstand contributes aesthetic appeal to the sea view rather than detracting from it. 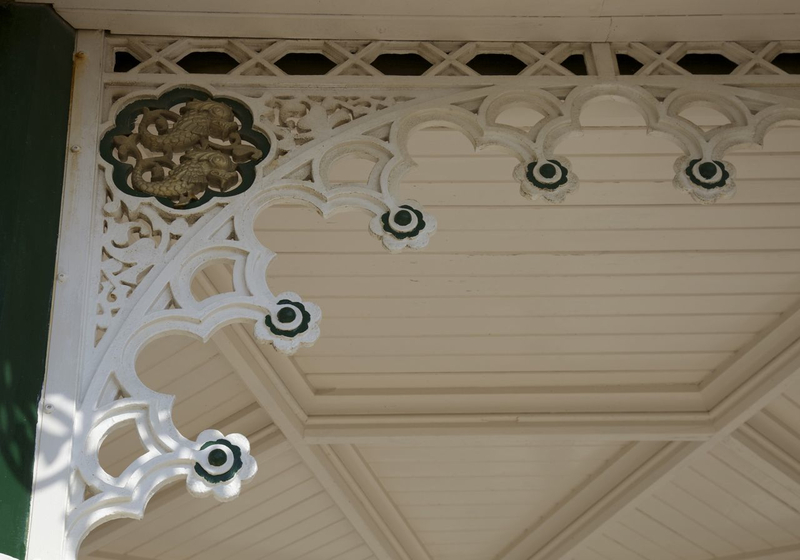 This sensitivity to social context in the design of the Brighton bandstand is reflected more widely in designs for public toilets in the Victorian period. 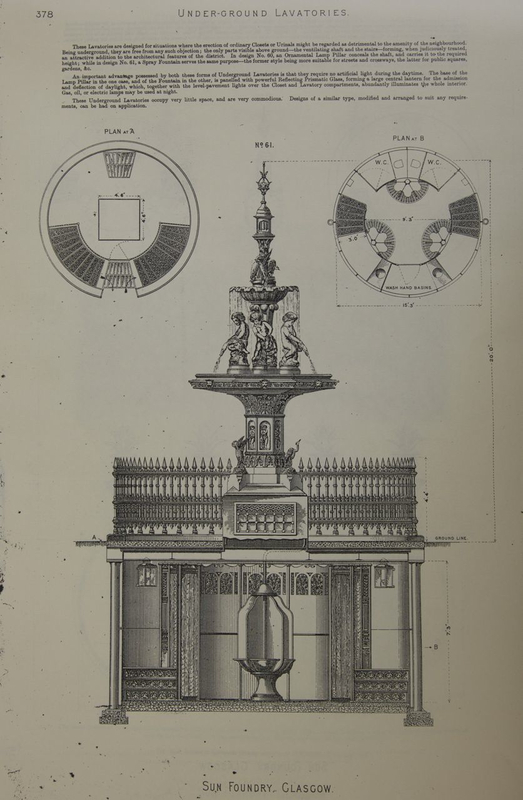 In an extraordinary series of examples illustrated in an 1890 catalogue of the Sun Foundry in Glasgow, the range of designs for public toilets (over 60) are explicitly related to their intended social contexts. In one example illustrated above (5), the functional part of the lavatory is completely concealed underground and is topped by an ornamental fountain and railings which also act as a ventilator for the toilets. The elaborate disguise of the toilet part of this structure is similar in conception to the Brighton bandstand/toilets; as the accompanying text makes clear, like its Brighton counterpart, this particular example is designed ‘for situations where the erection of ordinary Closets or Urinals might be regarded as detrimental to the amenity of the neighbourhood’.